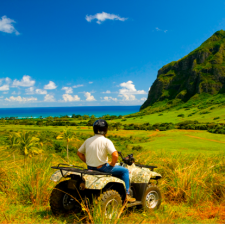 Take a guided ATV tour of scenic valleys and remote areas rarely visited by others, only 50 minutes from Ko Olina Beach Villas. Visit iconic Hollywood filming locations, explore some of Kualoa’s secret spots, and take in sweeping views of the Pacific Ocean. 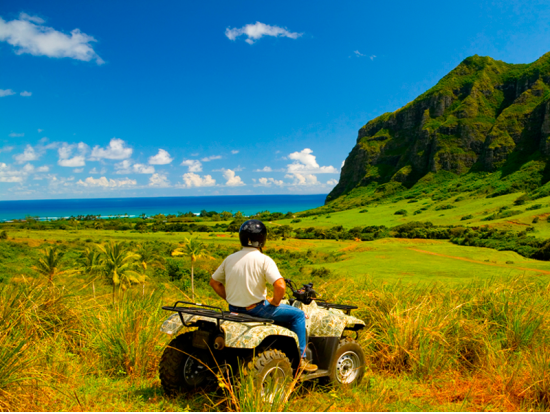 Kualoa Ranch offers one or two-hour tours on single passenger or multi-passenger ATVs. Tours cross streams and cut through jungle trails, rain or shine, so be sure to wear closed-toe shoes, long pants, and sunscreen. For more information about pricing and booking a tour, visit http://www.kualoa.com/oahu-tours/atv-tours/. This entry was posted in Things to Do - Ko Olina and tagged Hawaii, Ko Olina, Ko Olina Beach, Ko Olina Beach Resort, Ko Olina Beach Villas, Ko Olina Beach Villas Resort, Ko Olina Paradise, Ko Olina Resort, ko olina things to do, Oahu, Oahu Things To Do, Things to do in Hawaii, things to do in Oahu. Bookmark the permalink.